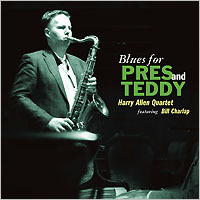 Description: Prolific and decidedly traditionalist tenor saxophonist Harry Allen teams up with supremely talented pianist Bill Charlap in this special tribute program to the classic album recorded 55 years ago by two giants, Lestor Young ("Pres") and Teddy Wilson ("Teddy"). With Peter Washington on bass and Dennis Mackrel on drums, they play the songs from the Pres and Teddy album plus an original blues written by Allen. While they display deep respect and deference to the subjects of the tribute, Allen and Charlap naturally infuse their individuality into the performance. Allen's fluid and smooth approach is well complimented by Charlap's creative improvisation. A very enjoyable album by the two great masters of today. Produced by Ikuyoshi Hirakawa. Recorded on September 26 & 27, 2011 at Charlestown Road Studio, New Jersey.